They solemnly swear they are up to nothing but good. With the end of the books and movie franchise, a little magic and a couple passionate fans at Ithaca College hope to keep the Potter spirit alive. The Harry Potter series, books and films started not just a phenomenon, but a foundation for people to be inspired and grow with the releases of the seven books. The IC chapter of the Harry Potter Alliance was founded in the fall of 2010 by senior journalism majors Emily Krempholtz and Monica Watson. According to their mission statement, the HPA is a national, nonprofit organization that “takes an outside-of-the-box approach to civic engagement by using parallels from the Harry Potter books to educate and mobilize young people across the world toward issues of literacy, equality and human rights.” Some social issues they are fighting include the climate crisis, bullying and child slavery. If there were a proper way to celebrate the books while giving back, any fan would say it would be through a Yule Ball, the dance in Harry Potter and The Goblet of Fire where Hogwarts celebrates the Triwizard Tournament. On Feb. 11, the IC chapter of HPA threw its first annual Yule Ball. Krempholtz said that this was one of the first things she wanted to do when they started the alliance two years ago. For one night, Emerson Suites was transformed into the Great Hall at Hogwarts. As you walked in, there were dozens of makeshift candles seemingly floating above the dance floor and enchanting butter beer available at the bar. Wizard rock musicians Justin Finch Fletchley, Lauren Fairweather and the Whomping Willows all played original Harry Potter related songs that set the mood for the night. After the bands, Zac Blitz and Jake Lifschultz’s DJing kept people dancing until midnight. Outside Emerson Suites, there were opportunities to take a picture of yourself going through Platform nine and three-quarters and put your face on an Azkaban wanted poster. The alliance also had tables set up with hand- crafted Harry Potter inspired jewelry, house scarves, raffles and treats. It was a fun event but what made it special was that for one night, we were living out the story we grew up with. “I wanted to make the Yule Ball as magical as it was in the books,” Krempholtz said. 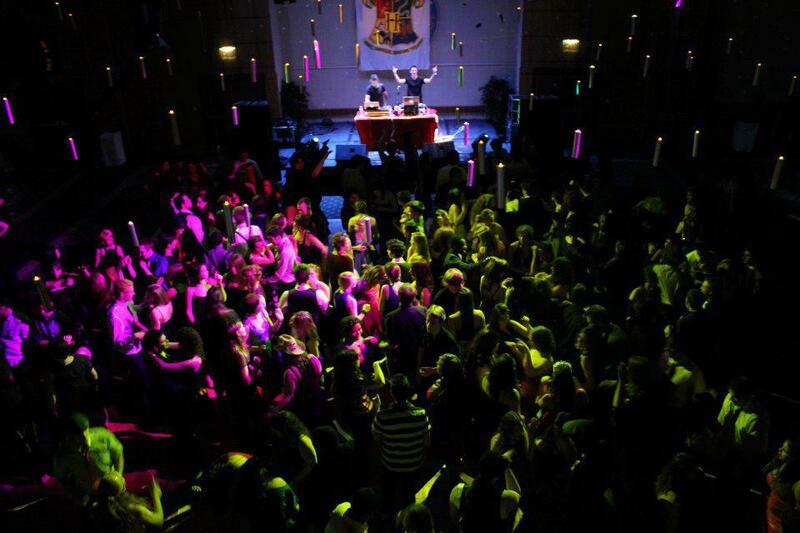 With over 400 people in attendance, both students non-students, it’s safe to say the first Yule Ball was a success. It wasn’t just a fun dance, but also a good cause. The alliance was chosen to receive a $1,000 grant from Splash Life, an organization whose goal is to be a resource for our generation and to support groups that are trying to help others. Half of the profits from the event have gone to the alliance and the other half will go to the Finger Lakes Land Trust, a nonprofit organization for nature conservation in upstate New York. Freshman member of the HPA, Sangita Burke, talked enthusiastically about her experience with the alliance and her love for Harry. Burke said she joined because of her passion for the books. Although the movies and books have ended, the magic surrounding the fandom certainly has not. Krempholtz said that the alliance plans to branch out into other popular books in the future that people feel equally passionate about. “The love for Harry Potter will never die, just like how people still read and love Shakespeare,” Watson said. The Ithaca College HPA plans to make the Yule Ball a yearly tradition and has high hopes for getting more great performers and being able to contribute back to the community again. Harry Potter changed our generation. We grew up with him from a young age, reading the books and watching the movies. Even though the movies have concluded, his spirit will live on through people like Krempholtz, Watson and Burke. Through Harry’s good deeds, we learn to do good deeds as well, and the Yule Ball is a great example of that. It’s an act of pure kindness and goodness that Dumbledore would approve. And though I waited for my Hogwarts letter like every other kid and it never came, for one night we were all there. Sara Flynn is a freshman cinema and photography and screenwriting major who wished she could have taken Viktor Krum to the Yule Ball. Email her at sflynn1[at]ithaca.edu.